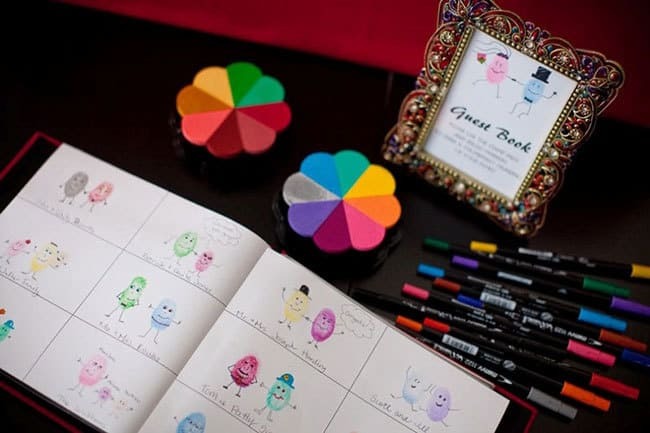 Looking for something a bit different from the traditional guest book? Check out these unique ideas for inspiration! 1. Wishing tree – A great DIY project! 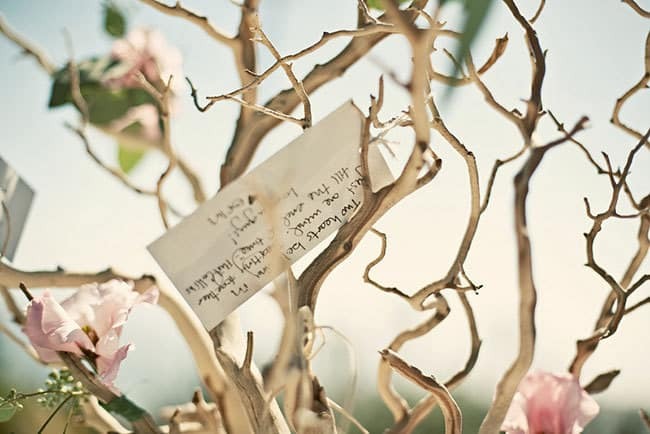 Secure branches in a glass vase with sand or stones and ask your guests to tie messages to them. Provide different coloured papers, pens or ribbons for a pretty reception feature. 2. Fingerprint artwork – Instead of signing, guests ink their finger to create leaves, balloons or characters on a canvas. Just remember to supply wipes for cleanup! 3. Group photo – Arrange with your photographer to shoot a group photo in lieu of signing a book. This will be a great record of all of your guests that you can also include in your thank you notes. 4. Jenga – Bring back great memories every time you play by asking guests to sign or write their messages on wooden Jenga pieces. Puzzle pieces are also a fun option! 5. Polaroids – Hire a camera or a photo booth for guests to take instant photos to include in an album alongside their well wishes. 6. Pebbles – Provide smooth stones and permanent markers for guests to write words of advice and congratulations before displaying them in a large glass vase as a decorative keepsake. 7. Vinyl records – Supply vintage vinyl records with song names you like, or create your own labels commemorating your wedding date. Guest messages can be written in metallic permanent marker, framed and displayed after the wedding! 8. Origami – Create an origami butterfly, heart or swan for each guest to sign at the reception. These can be transformed into a beautiful artwork for your home. 9. Wine bottles – Mark bottles of wine with the dates of your 1st, 5th, 10th, 15th and 20th anniversaries. Ask guests to write messages on the bottles and enjoy each in your chosen year. Cheers! 10. Quilt – Love will keep you warm if guests contribute their signatures and wishes to a handmade quilt. Pillows also make for a comfy and practical memento! 11. Memory box – Provide cards or scrolls for guests to write answers to questions such as, ‘What does love mean to you?’ or, ‘What is your favourite memory of the bride/groom/couple?’ A fill in the blank format is a fun alternative! 12. Typewriter – For a bit of old fashioned fun, ask guests to write their messages to you using a vintage typewriter! Pages can be bound into a beautiful book after the wedding. 13. Photo wall – Ask guests to bring a favourite photo of themselves with the bride/groom/couple to help create a beautiful display at the reception. The photos can be transferred to an album after the wedding for a beautiful keepsake.